Johni came to us with a huge website problem. She needed an online hub that could stand a high volume of traffic and offered a robust custom shopping experience. Johni is a professional genealogist, often featured on PBS’s show Finding Your Roots, so she needed a website that would not crash with thousands of visitors and would be easy to use form any device. Additionally, she needed to sell genealogy packages online, with custom database searches, and a follow-up email with forms for the customer to fill out and return. 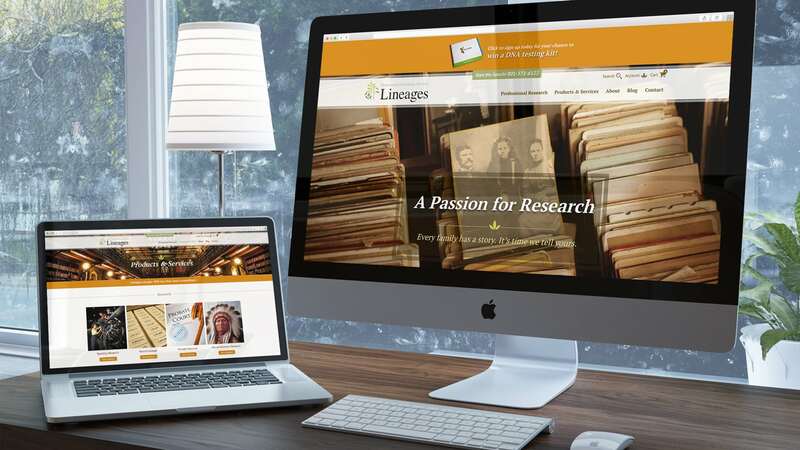 After we created a complete brand package, we got to work creating a custom WordPress website that would fulfill all of Lineage’s needs. Our entire team worked with Johni, based in Salt Lake City, Utah to match her dozens of products with the correct forms and databases. We helped Johni learn the custom WordPress backend and made it simple enough for her to train her entire team. Working on Lineages has been one of the most fun and fulfilling projects to date. We really enjoyed working on such a custom and complex website and shopping cart.